This Microgaming release is an online slot with a theme inspired by the Chinese Zodiac. 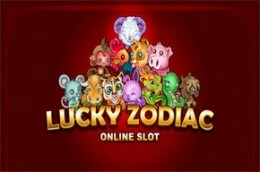 Lucky Zodiac is a 5-reels slot with 3 rows and 20 paylines and has oriental-theme related graphics and symbols. The lower value symbols are represented by the usual playing cards (10, J, Q, K and A) and the higher value ones are are a sheep, fans, an ornate vase, a Chinese lantern, and a blue lotus flower. The wild symbol is the Lucky Zodiac logo and the scatter is a firecracker.